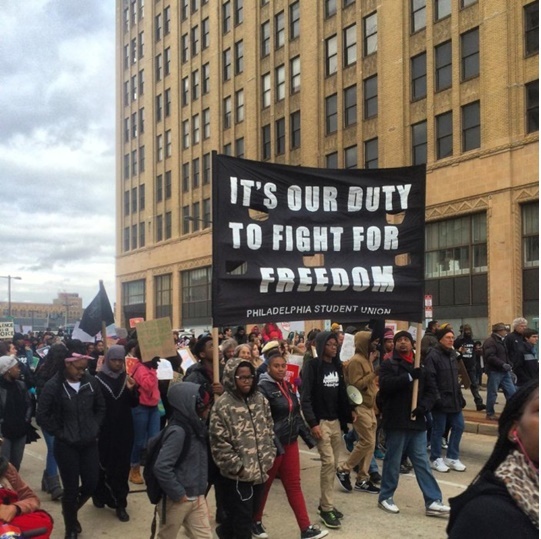 The sizable and militant mobilization of student youth in Philadelphia in March, in response to the school shooting at Marjory Stoneman Douglas High School in Parkland, Florida, on Feb. 14, illustrates two of the key aspects of the Resistance that Marxist-Humanist Initiative (MHI) wrote about in its 2018 Perspectives thesis: Resisting Trumpist Reaction and (Left Accommodation). Part Two of the Perspectives discusses the “intermingling of issues” within the Resistance, as the fight against Trumpism has brought together Me-Too, Black Lives Matter, immigrant rights advocates, environmentalists, and others. MHI’s Perspectives also lauds the ability of the Resistance to maintain its independence from bourgeois politicians and to avoid being co-opted by the Democratic Party. We can see both these aspects of the Resistance in the Philly students’ actions. The Parkland shooting produced an immediate surge of student activism around gun violence in which students around the country, especially in Florida, directly confronted their elected representatives, even on live television, and challenged them over their allegiance to the National Rifle Association (NRA) and over their lack of action on reforming gun laws in the US. In Philadelphia, students immediately mobilized in solidarity with the Parkland students. Students all across the city participated in the national walkout on March 14, holding vigils in front of their schools before marching on to City Hall. They participated in a roundtable discussion with city council member Helen Gym on school safety. They also organized a sizable March for Our Lives rally in Philadelphia on March 24, the day of the nation-wide marches, that brought out thousands of people of all ages. There are distinctive ways in which Philly students took ownership of these issues, however. They showed a keen ability to stand in solidarity with the Parkland students while at the same time articulating a distinct analysis and vision for school safety that was not merely an imitation of the national conversation. This should not be a surprise to anyone familiar with the strong tradition of student activism in Philadelphia, often led by the group Philadelphia Student Union (PSU), which fought a long fight against the state-created School Reform Commission, which has presided over a mass dismantling and defunding of the public school system for the past 16 years. Philadelphia students have been organized and militant for a long time over issues of school reform and school safety. So while voicing solidarity with student activists in Parkland, they also voiced frustration that their own militancy and activism has not gotten the media attention it deserves over the years. The fact that the Philly school population is largely Black and Latino–and poor–makes it quite different from the school in wealthy, mostly white Parkland. The lens through which Philly students responded to Parkland was affected by this very different racial and economic make-up of the two school systems. While 60% of Marjory Stoneman Douglas High School students are white, Black students make up 51% of the Philly school system and Hispanic/Latino students make up 20%. Naturally, this means that issues of social justice around race and immigration figure prominently in how Philly students think about school safety and struggles for freedom. The Black Lives Matter movement is at the forefront of youth consciousness in Philly, as is the fight against ICE (Immigration and Customs Enforcement) and Trump’s anti-immigrant politics. What it means for a school to be “safe” has been a topic of discussion for a long time in Philadelphia, as youth activists organized against the dismantling of public education and the rise of the “school-to- prison pipeline.” Thus, Philly students were ready to leap into the national dialogue around guns and school safety, but to articulate their own independent vision that reflects their own struggles at the same time. National student militancy around gun violence in response to the Parkland shooting comes at a crucial juncture for Philly students. After 16 years of having their school system run by the School “Reform” Commission, with no accountability to the citizens of the city, the long nightmare finally ended in November of 2017, when that commission voted to disband, turning school control back over to the city. This represents a major victory, one which students, teachers and parents fought for for a long time. It came at the same time as Philadelphians elected a new District Attorney, Larry Krasner. Krasner, a long-time civil-rights attorney and public defender with a radical program of criminal justice reform, was swept into office in the rise of the anti-Trump resistance and the Black Lives Matter movement. His promises to eliminate cash-bail, reform harsh sentencing guidelines, and to stay attuned to the mass movement that he rode into office, have led many in Philadelphia to hail his election as a major victory for critics of the criminal justice system. Indeed, the end of the School Reform Commission and the election of Krasner seem to show an opening for those fighting against the school to prison pipeline. As PSU members have argued in the past months, school safety, to them, does not mean more police officers in schools or arming teachers. PSU has long criticized the school-to-prison pipeline in Philly and the escalation of school policing, arguing that these are not the needed mechanisms to protect students from abuse by school security and to hold school police accountable. They also argue that a safe school is one in which students needn’t fear the ICE. Many have also expressed fear that stricter gun laws could be used as a tool to increase policing of black and brown communities. • protection of students and families from ICE arrests around schools. This is an interesting “intermingling of issues.” Gun violence and school safety are different beasts in Philadelphia than they are in Parkland. The students of PSU and other student activists deserve credit for being able to show solidarity while still spelling out their own vision of a safe school. In the same way that Parkland students showed their independence from bourgeois politicians, Philly students have showed their own independence, their desire to state their own vision of freedom, not conditioned by the terms of others. The ability to show solidarity with others while still articulating one’s own vision of freedom is one of the more important aspects of the struggle for human freedom. It realizes that no one is free until all are free, while at the same time realizing that the conditions of freedom are complex and varying, and that a vision of freedom is not something that one imports from outside, but one that a people must create for themselves, based on their conditions. To hold both of these things in the mind at once is not so easy as it might appear. It is a credit to Philadelphia students that they have been able to do so. Philadelphia students that they have been able to do so.